Notes: Based on the manga by Eiji Nonaka, available in North America. Cromartie High School is named after Warren Cromartie, formerly of the Montreal Expos, who played for the Tokyo Giants. Other high schools in the series are also named after gaijin baseballers, largely because the manga artist is a very weird man. Mild-mannered Takashi Kamiyama somehow ended up in Cromartie High School, a place where delinquents rule the roost. Somehow, he ended up as the "strongest man in class", so he must now find a way to unite the various factions of punks into a cohesive force against rival high schools. But he finds out that not all is as it seems at this wacky school. Is Takenouchi really a tough-faced badass? What's with that rock-singer-looking guy? And there's something strange about Mechazawa and his constant ... maintenance. Can Kamiyama dodge the mohawks and pompadours and survive to become the biggest badass of them all, even while still being a "perfectly normal high schooler"? Shouldn't we just dispense with the drama and enjoy the ride? Over the last ten to twelve years, there has been a trend of slapping together as many silly things as possible to create a parody. First, there was Dragon Half. Then there was Elf Princess Rane. Then it was Excel Saga and Puni Puni Poemy. This light-speed acceleration has led to a lot of laughs, but lately, it's seemed like too much of a good thing. Works like Trouble Chocolate prove conclusively that humor can not be measured simply be calculating the number of jokes per minute. Thankfully, Cromartie High School is NOT one of those anime. Cromartie High is a gloriously skewed and self-aware collage of sight gags, with remarkably intelligent deadpan humor that delivers a humorous slant on numerous facets of Japanese culture. In a sense, it's the tough-guy version of Azumanga Daioh, but it involves a lot more of the surreal, and the tone is utterly different, since unlike the slice-of-life randomness of Azumanga, Cromartie is a very obvious parody with large streaks of satire. It is also a damn good show. Takashi Kamiyama (played equally well by Ben Pronsky and Takahiro Sakurai) is a riot as the downtrodden "normal guy" who somehow ends up being every bit as stupid as everyone else around him. His deadpan affect when talking to people who eat pencils for breakfast is just great. (How did he get here? Read the manga, he says.) The "school badasses" are an assortment of weirdoes and misfits that will linger long past the end of the DVD, like the hapless Takenouchi, who looks tough, but only because he has ... a problem with vehicles. Or Maeda, who no one will take seriously because he didn't have a nickname in junior high. Or Hayashida, the tough-as-nails advisor with a mohawk that seems to have a life of its own. And, of course, the sweet-talking punk robot Shinichi Mechazawa, who manages to be even stranger than the 400-pound gorilla in Class 1-3. And then there's that rock-singer-looking guy, who everyone simply calls "Freddie". If you recognize the album cover being parodied in the first DVD of Cromartie High, then you know who I'm talking about, and yes, he's a major character. If that's not badass, I don't know what is. The storyline is fairly simple -- it follows the everyday existence of Kamiyama and his crazy delinquent classmates, who somehow, never seem to be too different, or any smarter, than any other group of teenagers. It's understated, and largely a basis for the pervasive, but well-executed visual humor in this series. However, it should be noted that a lot of the humor is based on the tough-guy "delinquent" genre of boys comics, which is very sparsely represented in North American releases. primarily by GTO and the significantly more obscure Bomber Bikers of Shonan and Bite Me! Chameleon. More recently, another comedy, Gokusen, takes on the same topic from a somewhat different angle. Some people will find fault with the simplistic animation, but consider the following: shows of the "delinquent" genre have been notorious for poor animation quality, which is part of the reason very few of these titles are ever licensed. It's purposely terrible, with unattractive art, excessive and heavy hash lines, and lots of still frames, and it's even referenced numerous times as a joke in its own right. The eclectic music isn't much "better" per se, though one episode revolves around the whole cast trying to remember the title of a 90s hit song by humming it (and largely failing). Technically speaking, this simply isn't a show to take seriously. I mean, why would you? It's a comedy! Much kudos goes to the ADR team (especially Ben Pronsky) for giving the dub exactly the amount of silliness and energy needed to pull off such a cracked show. Choosing between dub and sub is a hard decision, because the Japanese cast of all-star tough-guys rocks my casbah, particularly Norio Wakamoto (Coach from Gunbuster), a wonderful casting choice as Shinichi Mechazawa. 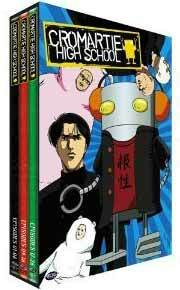 There is going to be a good portion of anime fans who simply won't "get" Cromartie High School. With its plethora of obscure references, endless in-jokes, and its basis on the "delinquent" subculture of Japanese youth, a lot of Westerners may look at this, and wonder what the big deal is. As for me, I'm going to be popping this series into my DVD player over and over again and laughing myself off my seat. Recommended Audience: Teens and up. About the only thing to worry about here is some violence (mostly implied) and harsh language, though frankly, the humor is aimed at an audience that is high-school age or older.